1. Use customer service data to determine what channels customers prefer for which queries, and provide for those preferences. Chatbots and other digital messaging services are essential tools to use when connecting with customers. They’re perfect for quick and easy transactions that don’t require advanced problem-solving. But what happens when a customer has a complicated request? The ability of a bot to respond intuitively to these types of requests is limited. If a customer is making a repeated request with a bot that’s not able to creatively respond, the result is frustration and a huge uptick in abandonment rates. Giving customers the option to change their mode of communication prevents this scenario from happening. Even better is using embedded data analysis to address the problem as it occurs. Records of session length and termination times can help determine the rate at which customers switch over to an agent or end a chat session without making a purchase. Both pieces of information can reveal the customer perspective on their interaction with a brand. A study from Opinium Research and IDC shows that despite the uptick in automated and digital solutions to customer service, 79% of customers prefer speaking with a human agent to a bot. This unexpectedly high number has a lot to do with the types of requests a bot can respond to. Customers can identify whether their request requires a creative problem-solving approach, which automated solutions cannot handle with ease, at least at this point in time. When they have a problem with a high level of complexity, customers will self-select a human agent to help them troubleshoot their issue. Part of the desire to speak to a human also may have to do with the level of control the consumer feels they retain in a person-to-person interaction. The same study showed that 68% of customers believe they’re more likely to negotiate a better deal while speaking to a live person, rather than a bot. Customers understand that the ability to weigh information and offer alternatives is a uniquely human skill, so they’re interested in making a more personalized connection if they believe it will benefit them in the long run. Being able to capture a customer’s personal history means a company can tailor a customer service experience to fit each customer. Whenever possible (and always with customer consent) collecting data about contact history provides for a better customer service experience — both from the perspective of the customer and from the agent. The first piece of data to collect is the category of contact. Is this a question or issue with an existing service? Is it requesting an upgrade to a current product? Is it a straightforward order call? The next piece of information to capture is if this is a repeated contact or a new contact. In other words, does the customer make contact about the same thing each time, or are their queries varied? Finally, collecting quantitative data about time of call and length of call is a small piece of information that can provide huge insight when combined with other data points. Even these three simple categories of data can help drive automation trees and prepare agents for the type of queries they’re likely to receive. In aggregate, the data can provide even more information about your customer base as a whole, helping you to target products and services more effectively. 4. Track customer data across communication channels. Many companies have switched to an omnichannel customer service solution to reach customers in a variety of different ways. Generally, customers appreciate these options that allow them to choose when, how, and for how long they interact with a brand. However, in the rush to adopt an omnichannel IVR, the connectability of different elements of the system are not always intertwined. This can lead to customers having to repeat or enter information they provided previously in another channel. Tracking user experience (UX) across platforms ensures a consistent brand experience regardless of what mode of communication consumers use — even if that choice includes multiple modes. 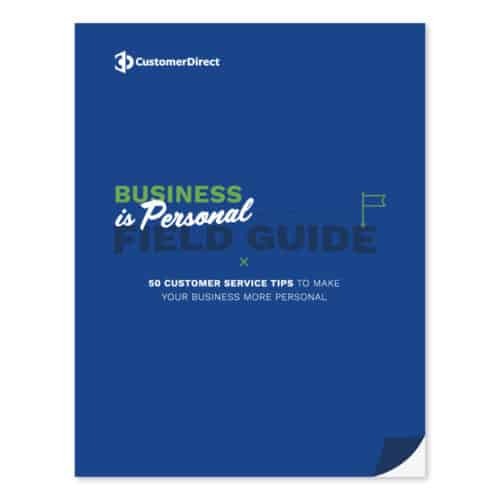 We hope this guide has helped you understand more about how to provide customers with the best possible omnichannel solution. A combination of data collection and flexibility will give your brand the ability to pivot to best support you entire customer base. Customer Direct can provide a solution customized to your business so that your customers experience genuine customer service on any platform where they want to engage in a conversation. For help implementing an omnichannel customer service solution that adapts to your needs, contact us.